At LINE-X, we know your truck is much more than a vehicle to you. It can be your workhorse or your plaything. Either way, it deserves serious protection every way you use it. That’s why the name LINE-X has become synonymous with toughness. For 20 years our LINE-X STANDARD Spray-On Bedliner has protected over 3 million trucks. When you’re looking for durability, function and affordability, LINE-X’s proven formula is what you need. 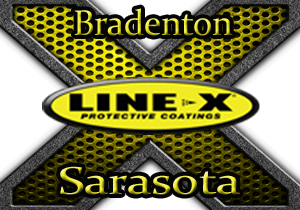 LINE-X guarantees the highest quality, professional installation. A LINE-X Spray-On Bedliner is guaranteed not to crack, bubble or flake for as long as you own your truck. Plus, even if you damage your truck and it’s not covered by the warranty, LINE-X can still be seamlessly repaired at your nearest location. With a higher tensile strength than our competition, LINE-X provides unmatched protection against gouges, rips and tears. You’ll notice less road noise, and a rattle-free, quiet ride when compared to an unprotected or drop-in liner. And the thick, textured impact-absorbing surface of LINE-X Spray-On Bedliners also protect cargo from shifting. With no lost cargo space, bed lids, camper shells, 5th wheel hitches, tie-downs, utility boxes, etc. all fit great because LINE-X molds to the precise surface of your truck bed. Typically, any inspection plates or tie-downs are removed, sprayed if applicable, and then reinstalled. LINE-X permanently bonds to your truck bed, with a factory-like finish that follows every angle and curve to preserve precious cargo space while creating a watertight seal. No air gaps or drill holes to give water a place to hide – and rust a chance to take hold. Independent tests show that LINE-X Spray-On Bedliners are resistant to most chemicals including chlorine, gasoline, diesel fuel, bleach, and most household solvents. Every professionally applied LINE-X Spray-On Bedliner contains tough polymers engineered to withstand years of heavy-duty use in the searing heat or arctic cold. What’s more, a LINE-X Spray-On Bedliner adds to your truck’s daily value – as well as its resale value at trade-in time.